Pop star Selena Gomez has revealed that she recently underwent a kidney transplant due to her battle with lupus. The 25-year-old singer announced it via instagram to explain why she has been 'laying low' over the summer. "So I found out I needed to get a kidney transplant due to my Lupus and was recovering. 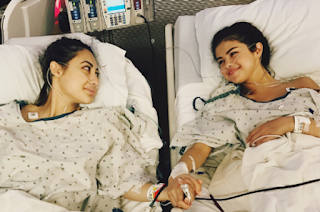 It was what I needed to do for my overall health" she wrote in her lengthy post, which includes a photo of herself with her best friend Francia Raisa who was her donor. "There aren’t words to describe how I can possibly thank my beautiful friend Francia Raisa. She gave me the ultimate gift and sacrifice by donating her kidney to me. I am incredibly blessed." she continued. Selena also promised her fans to reveal more details regarding her health in the near future. "I honestly look forward to sharing with you, soon my journey through these past several months as I have always wanted to do with you" she said.